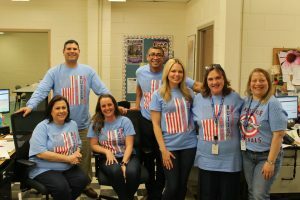 Throughout the month of April, students and staff at General Douglas MacArthur High School have strived to raise awareness for autism, a spectrum disorder that impacts people around the world, including the Levittown community. 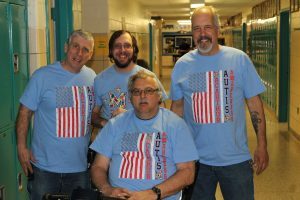 Under the guidance of teacher and coordinator Vincent Causeman, MacArthur High School has embraced Autism Awareness Month for the past eight years with special sporting events, colorful hallway decorations and a T-shirt drive, whose sale annually funds the Nassau Suffolk chapter of the Autism Society of America. The NSASA helps families on Long Island who have children on the spectrum by providing services and holding special events. MacArthur High School’s goal to educate others has increased throughout the years as students and staff constantly seek new ways to show their support. 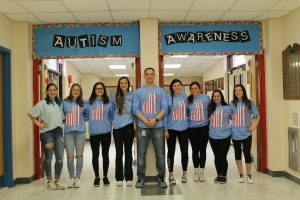 On April 11, the MacArthur girls softball team competed in an autism awareness game against Division Avenue High School, followed by students and staff donning matching autism awareness T-shirts on April 13. Dressed in their light blue shirts, students watched a special morning announcement that was produced by teacher Bill Farney. 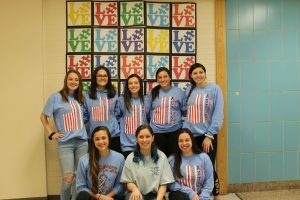 The video featured the school’s challenger team, a basketball league consisting of secondary-level students from the Levittown Public School’s Applied Behavior Analysis program and others with physical disabilities. MacArthur High School buddies spoke in the video about how working with students on the challenger team has inspired them. Students, staff and administrators at MacArthur also produce a Public Service Announcement each year about autism awareness which will be premiered towards the end of the month. In addition, the school hosted their sixth LAX for Autism game against Plainview-Old Bethpage School District on April 14, which will be followed by their first Generals Walk for Autism on April 18 and third annual Strike Out Autism baseball game against Plainview-Old Bethpage School District on April 21. MacArthur High School’s Autism Awareness Month committee with coordinator Vince Causeman (middle). 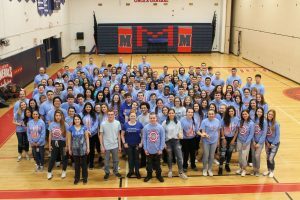 MacArthur High School students, staff and administrators created a sea of light blue in their 2018 Autism Awareness shirts. Staff members at MacArthur High School including Assistant Principal Anthony Allison (back right), light it up blue for Autism Awareness Month. MacArthur High School custodians showed their support for Autism Awareness Month. MacArthur High School students proudly wear blue for Autism Awareness Month. 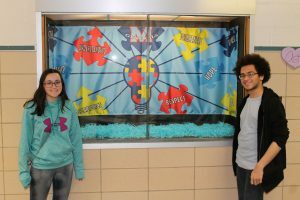 Students Samantha Mercaldo (left) and Steven Villanueva (right) from MacArthur High School with a student-made banner for Autism Awareness Month.